In the book Bandersnatch, a close look at the creative collaboration of the Oxford “Inklings” (C.S. Lewis, J.R.R. Tolkien, and others), the author tells us that for even the most successful writers, “The excitement of creating is followed by desperate self-doubt. Courage and inspiration compete with discouragement and despair.” Many young writers are all too familiar with self-doubt and discouragement! One of the main goals of our middle school Writing Program is helping students understand that these feelings are a natural part of the writing process, that way they can grow in courage and self-confidence. In grades 6 and 7, students will engage in a self-paced course aimed towards improving spelling, punctuation, grammar, and organization. 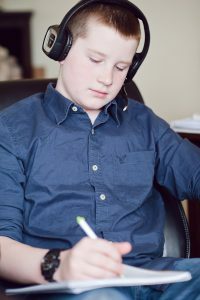 Through video instruction and thorough writing feedback, students will increase in writing fluency, gain confidence, and strengthen their abilities to write clearly, cohesively, and consistently following grammar rules and conventions. Students should plan to write daily (5-days a week) for 15-20 minutes each day to complete the course homework. Daily writing improves writing fluency and confidence and allows for prompt feedback, helping students stay motivated and focused in order to maximize learning. Our middle school writing program uses challenging assignments and meaningful feedback to prepare students for high school level writing. Writing 8 A and B courses are specifically designed for 8th-grade students who are ready to learn and practice new skills, develop their individual writing style, and gain new perspective about why writing matters. Students carefully explore each step of the writing process (inquiry, outlining, drafting, and revision) and reflect on the value of strategic writing. They also practice creative writing and have the opportunity to craft poems and short stories. In Writing 8 A, students lay the foundation for the advanced essay writing that will be required in high school and college: well-constructed paragraphs. The course includes grammar, spelling, and punctuation, sentence structure, and developing individual writing styles. When students have mastered sentence and paragraph construction, they’re ready to write three and five-paragraph essays. Writing 8 B helps students focus their thoughts, clarify and develop their ideas, and choose patterns of communication that others can easily understand. Writing therefore builds their confidence and increases their likelihood of success in high school, college, and life. Students learn to focus, clarify, and develop their ideas in the format of three and five-paragraph essays.